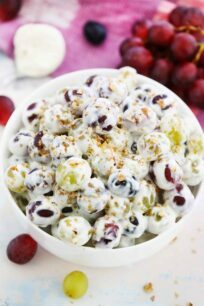 Grape salad is a simple dessert that can be easily prepared on a whim. An easy recipe with very few ingredients, even those who can’t cook can prepare this! 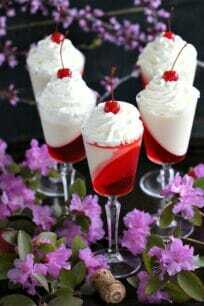 With summer around the corner, this is the perfect recipe to make. We also love cucumber salad, taco salad, or broccoli salad. Grape salad is a perfect picnic or potluck dessert as you can readily prepare it even when you have little to no time to spare. I love how grapes can be both sweet and sour at the same time. The grapes pop in your mouth as you bite into them which makes this salad delightful to eat. In addition, the creamy sauce that coats each grape provides balance with its tanginess. Not only is this dessert easy to make and delicious, but it is also extremely healthy because of the grapes. Eating grapes have been proven to be beneficial mainly because they have high levels of vitamins C and K, high in antioxidants and fiber, and have no cholesterol. These are just a few of the many health benefits of grapes which basically makes indulging in this recipe guilt-free! You can serve it as a main dish, side dish or snack. How to make Grape Salad? The first step is to prepare the grapes. Make sure to use only the freshest ones that are perfectly ripe. Wash the grapes. Then, take the stems out and lay them down to dry on a paper towel. While doing this, you can take out the cream cheese so that it starts to soften to ambient temperature. 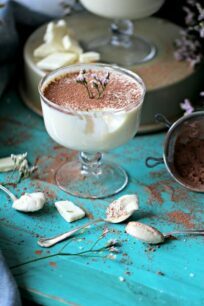 In a bowl, combine the sour cream, vanilla extract, and white sugar with the softened cream cheese and blend them together, preferably with a mixer, until smooth. Toss in the grapes, and fold with a spatula, to coat each grape with the creamy sauce. Cover the bowl and refrigerate for at least an hour. Top with brown sugar and nuts of your choice. For this, we like to add either chopped pecan nuts or walnuts. These nuts add crunch and more flavors to this snack. You can alter the proportions of the ingredients and adjust it to your liking. Grape salad reminds me of another favorite – cheesecake! The creamy sauce that is in this grape salad is made of cream cheese, sour cream, sugar, and vanilla extract mixed to smooth perfection. These are the very same ingredients that makeup cheesecake filling minus the eggs. By now, you get to know how this great side dish or dessert tastes like. Of course, the grapes are the main attraction. They provide a balance of sweetness and sourness, and biting into them feels like an adventure. They burst when you bite into them, and they are just a joy to eat, never boring! In this easy recipe, we use a variety of grapes in just one salad. The red ones are on the sweeter side compared to the green grapes which are on the other end of the spectrum for their sourness. But, combine them together and you get a yin-yang of flavors and colors, too. However, feel free to add in any type of grape that you like. How to make Grape Salad with cream cheese? When making the creamy sauce for the grapes, remember to soften the cream cheese at room temperature. It may take hours so plan ahead. The reason for this is to make sure that when you mix the cream cheese together with the rest of the sauce ingredients, there would be minimal lumps. 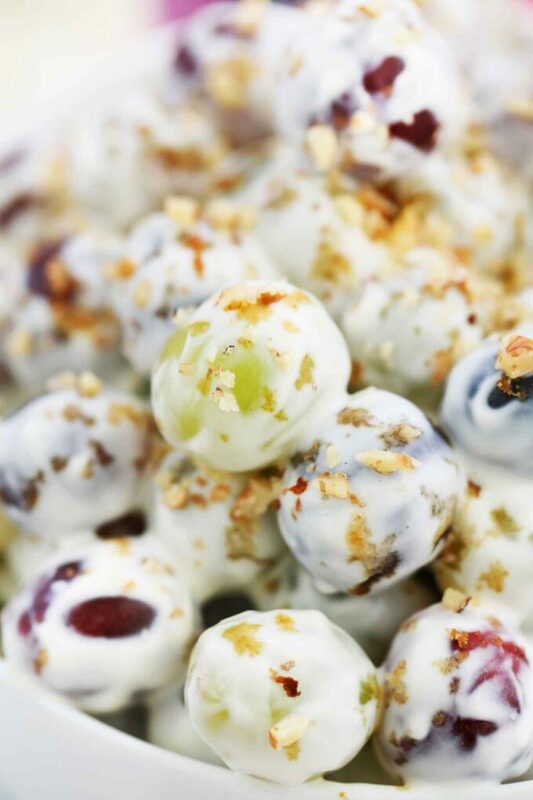 Then, simply mix the cream cheese with the grape and you have the most delicious homemade grape salad. 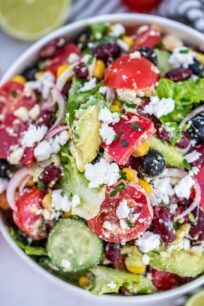 How to make Grape Salad without sour cream? If you have no sour cream or do not like using it, simply skip it. In addition, you can always substitute this ingredient with yogurt. Yogurt is a great alternative as it provides the sourness and creaminess to this dish. If you have leftover, it can be kept in the refrigerator for about three days before it goes bad. Just make sure to keep it sealed properly. Try adding some coconut, or toffee bits, or your favorite chocolate bars for added crunch. You can opt for nuts other than pecan or walnut. Just make sure that they are toasted with no salt. Also, if you are on a diet, you can opt for low-fat cream cheese. 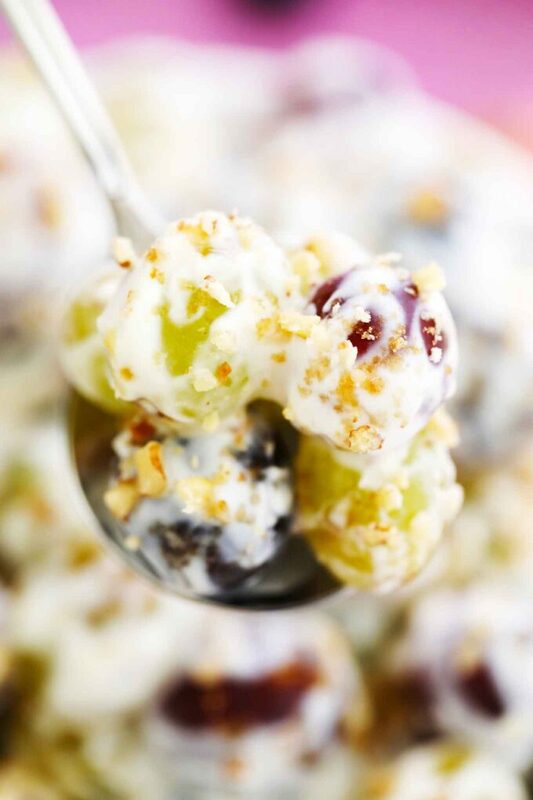 Grape salad is a simple dessert that can be easily prepared on a whim. An easy recipe with very few ingredients, even those who can't cook can prepare this! In a large bowl beat cream cheese, sour cream, white sugar, and vanilla extract until smooth. Add grapes and gently fold in until evenly coated in the creamy sauce. Cover the bowl with plastic wrap and refrigerate for at least one hour or overnight. 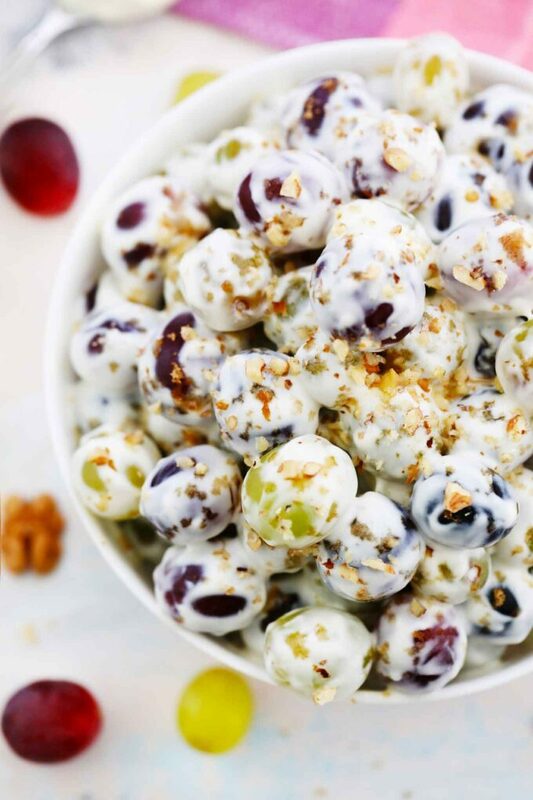 Before serving, sprinkle grape salad with brown sugar and chopped pecans or walnuts.